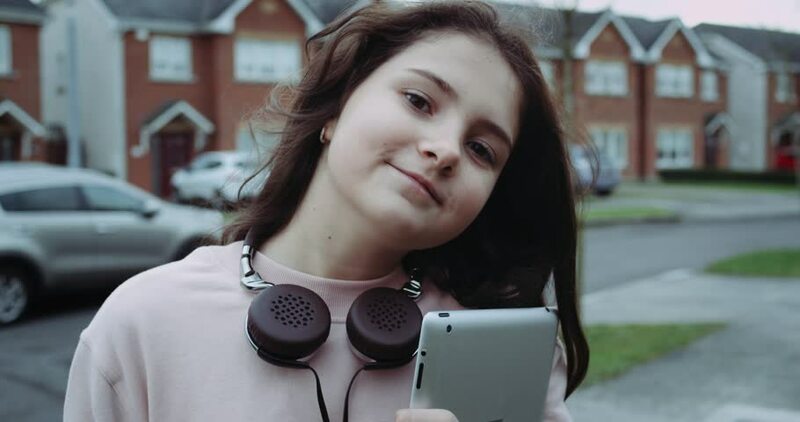 Pretty young girl with headphones and tablet computer looking in camera. Girl holding tablet computer in front of country street with red brick houses. Red Epic 4k. Slow motion. 4k00:10Professional young woman photographer with digital camera taking pictures at autumn city park. Close up, slow motion, shallow depth of field. 4k00:16Female hands making heart shape gesture holding sun flare with fingers in the blue sky. Slow motion 4k. 4k00:11Two young and beautifull girl with long hair making selfie on the smartphone sitting in front of train bridge. Shot in slow motion 4k. 4k00:194K. Young woman and child smile. slow motion. Red Epic. 4k00:10Pretty young girl with headphones sitting in front yard of home. Girl texting message on cell phone with country house in background. Red Epic camera. Shot in 4k. 4k00:09Portrait of young girl dressed in pink vest near metallic fence. Girl listening music in headphones and going away. Shot in 4k. 4k00:29Outdoor portrait of teen friends taking photos with a smartphone.Teenage girls making self portrait. Selfie. Slow motion. Red Epic 4k.